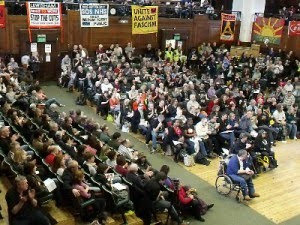 Over the weekend, the British Socialist Workers Party - which has been heavily involved in the build up to the Egyptian revolution, organized a Peoples Convention in London. While primarily about organizing mass resistance to proposed Conservative/Lib-Dem government budget cuts, the lessons of Egypt were not lost on the participants. Every anti cuts campaigner has taken inspiration from the events in Egypt and the mass student protests in Britain . If Egyptian workers can overthrow Mubarak we can certainly settle accounts with Cameron and Clegg here. Build the 26 March TUC demonstration against cuts in our workplaces, colleges and communities. Accordingly we propose that on the weekend of 19 and 20 March every organisation, campaign and trade union backing the march come together in every locality to hold mass leafleting, street meetings, stalls, car cavalcades and so on to build the demonstration. Tuesday, 15 February and the CoR Valentines Day rally at Downing Street. Support all those councils and councillors who vote against cuts, urge others to follow their example and in addition organise protests, blockades and occupations to stop councils passing cuts budgets. Applaud the calls from a number of trade unions for co-ordinated strike action and will campaign to achieve this over the coming weeks. The violent S.W.P/communist led student riots of late 2010, were simply a dress rehearsal for what is planned for 2011. How and when did we all begin feeling that we are "entitled" and should never have our salaries cut or benefits cut due to monetary problems? Common sense is dead. A friend of ours who is in a union (doesn't care for it though), drove his car past a store that union workers had supposedly not built and a co worker was there picketing. The co worker called our friend and started hollering at him that he should have stopped or at least honked in support. Our friend then explained that the company the idiot works for, actually built the store, so he is protesting against his own company. Shortly after that, all the idiots packed up and left.....they listen to the union heads and don't check things out themselves.....start your own research, people!!!! Go ahead, McDonnell - you putz - march and demand. Too bad for you the well has finally run dry. Where to Now for the Poor of Egypt?